If autonomy is one of the aspects that you value most when selecting a smartphone, you will be happy to know the Energizer Power Max P16K Pro, the cell phone with the highest battery in the world. It is the new terminal that Energizer, a brand specialized in resistant devices with great autonomy, has announced at the Mobile World Congress in Barcelona. 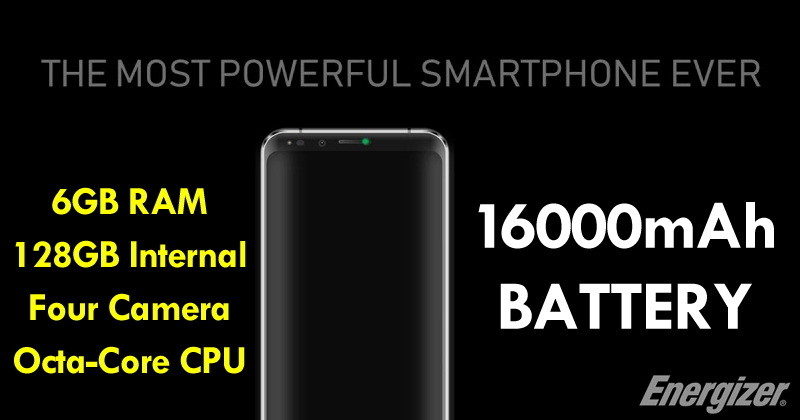 This smartphone boasts a monstrous 16000 mAh battery, which is by far the most powerful in the world. 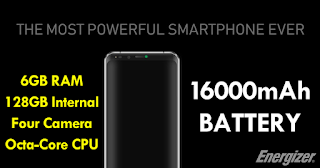 The Power Max P16K Pro has an IPS screen of 5.99 inches, with an aspect ratio of 18:9 and a resolution of 1080×2160 pixels. How could it be otherwise, the great capacity of the battery has taken its toll on what weight and dimensions are concerned: it has a thickness of about 15mm and a weight of about 350gm. To put it in perspective, the Galaxy S9 presents a thickness of 8.5mm and 163gm in weight, the Galaxy Note 8 8.6mm in thickness and 195gm in weight, and the iPhone X 7.7mm in thickness and 174gm. The smartphone with the world’s largest battery mounts a MediaTek Helio P25 mid-range chipset with an eight-core CPU which is clocked at 2.5 GHz and Mali-G71 MP2 GPU, accompanied by 6GB of RAM and 128GB of internal storage, while the operating system is Android 8.0 Oreo. In the photographic section, we find four cameras, two main and two fronts. The dual rear camera system consists of two 13 and 16 MP sensors with dual LED flash, while in the front we have a 5 MP camera and another 13 MP for selfies. The equipment is completed with a fingerprint reader and a 3.5 mm headphone jack.